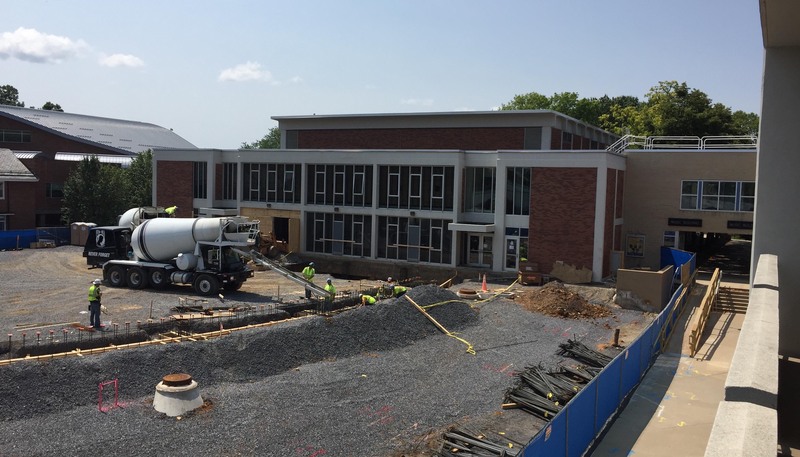 Please see the Penn State School of Music Facebook page for photos and more updates! Room 110 is being waxed for the new risers which are set to arrive on Monday, July 2. Chairs will come in a month! Hallways of the second floor are painted. Door frames are being painted today. Those of you with your second door blocked may find a bookcase moved, etc. All doors must be opened to paint the frames. In the next few days, the ceiling will go in as well as new lights. We are a couple weeks away from floor tile. Mailroom: Almost finished! – There were a few issues that need to be addressed but it should be easy details to fix. Main offices: Are being painted this week along with new lights. Carpet comes in the next weeks. Outside: Once the railings arrive and are installed, most of the Stone Terrace (the name) will be landscaped and open to use! Forum Walls: Look at the forum walls near us – they are gone! The new acoustic banners are installed in the new hall – dry wall is being installed and painted. The new restroom fixtures are being installed with the new tile – it looks awesome!!! Second floor restrooms are still offline. 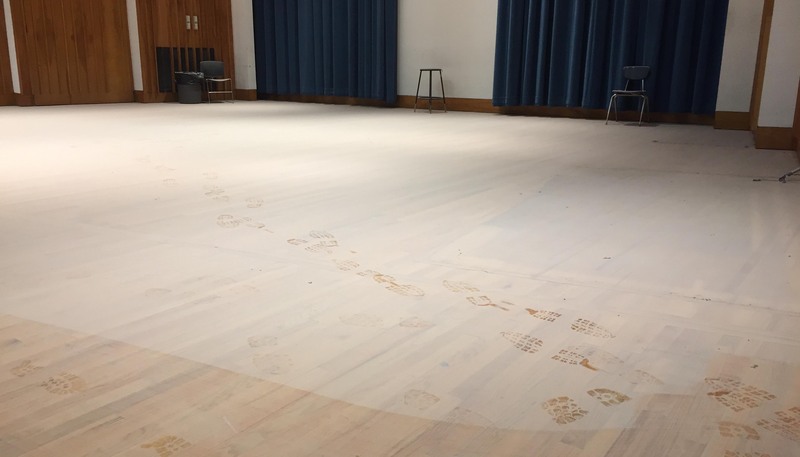 The rehearsal hall is slowly coming along – the crew ran into some unexpected challenges – so we’re a bit behind. – We will have a plan IF there are more delays for the opening. The new hall is now running behind. Looking like mid September for us to take occupancy. 90-120 days to go - the final push is on! 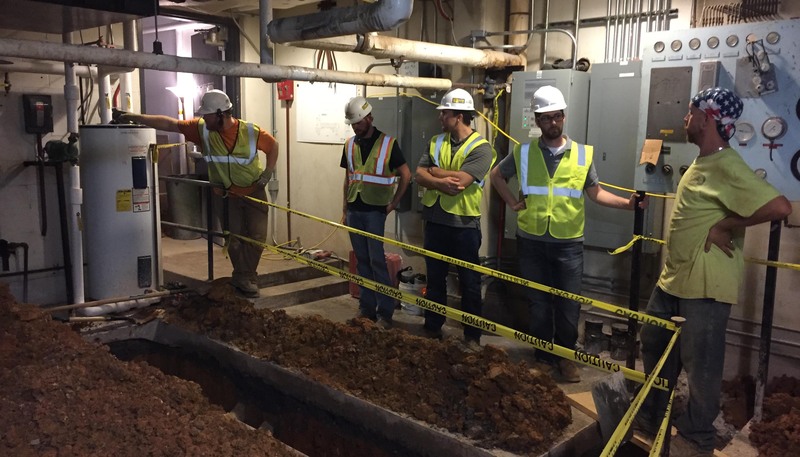 Starting on Monday, May 7, workers will be in the hallways insulating the duct work, installing the sprinklers into offices, and finishing up new wiring (they have been working nights for the past couple weeks). 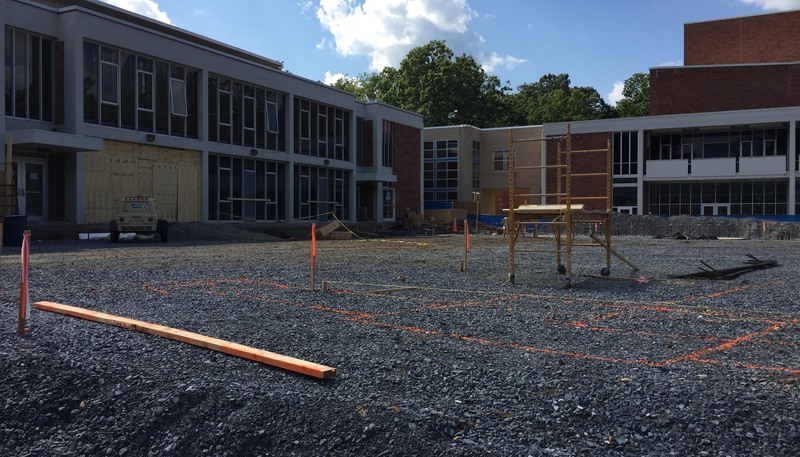 After that, they will install the new floors and hallway lights, and we will have new restrooms, mailroom, staff offices, painting, caulking, and ceilings. Chris Wahlmark’s old office by room 100 is being demolished on Monday, May 7. That entry will be closed. You will need to enter into Music II or by my office to Music I. The mailroom is going off line! We will be clearing out the mailroom so that as the worker’s schedule permits they can begin installing new cabinets. The printer and copier will be relocated for the next few months. 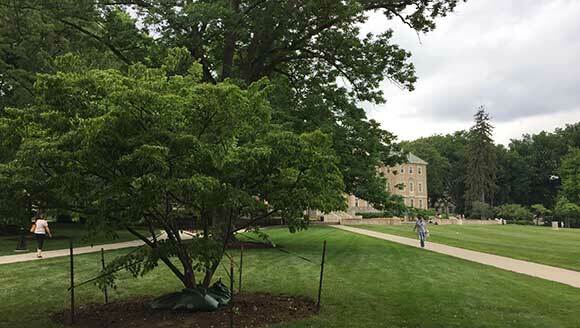 The breezeway is closed next weekend for the tie in for the new sprinkler system. You may have a circuitous route in order to get where you are going. This should only be for a few days. There will be times when hallways in Music I will be closed. Especially during the new floor installation. The School offices will remain in 102 Music I until the old offices are painted and carpeted. We anticipate normal business hours. Depending on the workers’ schedules, you may need to enter through a different outside door. We expect Music II building hours to remain 7a.m. to 11:00 p.m. But, with Music I being technically “off-line,” Music II may also not get unlocked – especially on weekends. Please be prepared with your C Key to enter the building. Please use caution as you come and go into Music I. The halls will be congested. Mother Nature hasn't been helpful with our project. We were hoping that March and April would be warmer so that as we made the switch over from the old HVAC to the NEW HVAC, we'd have enough warm days to not notice the heat not being on. We are hopeful that come Monday, April 9, we will be up and running. THANK YOU for your patience, understanding, and good nature through this. The complaints were warranted - the solutions were really nonexistent - better days ahead! In the coming days work on the landscape will begin. 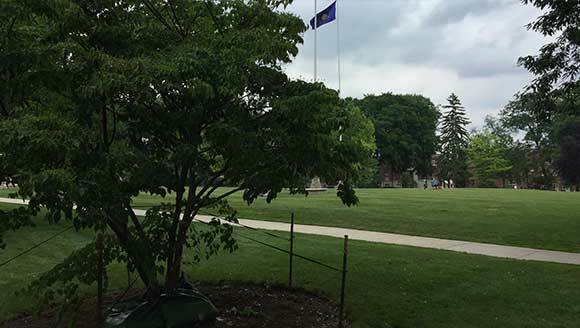 The crews will start near the steps between Music I and II (inside the blue fence) and work their way around towards the Chapel. Also, the plastic will slowly be replaced by our new glass! High above the stage and seating areas the crews have literally built another floor (they call it a dance floor) so that the men can more easily install the duct work, electric, and eventually the acoustic ceiling. 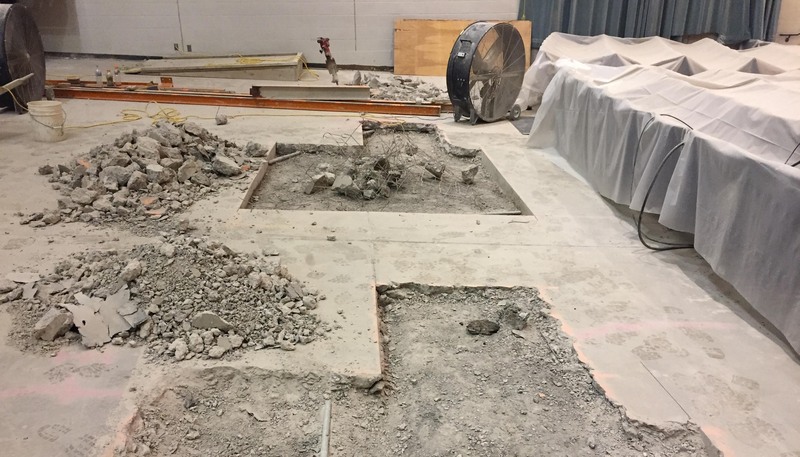 In Esber Rehearsal Hall, now that the corner cement "wedges" are gone and the old doors are cemented shut, crews will start erecting steel to begin roughing in the space to create the new rehearsal space. 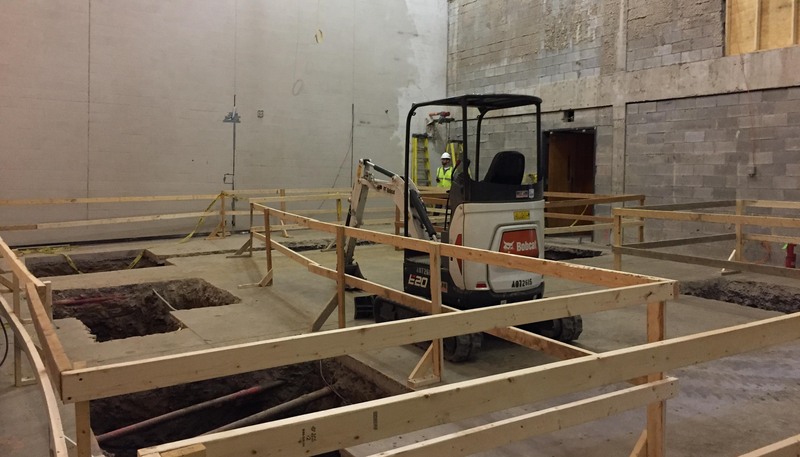 The floor of new rehearsal space in the old Esber Recital Hall was poured. 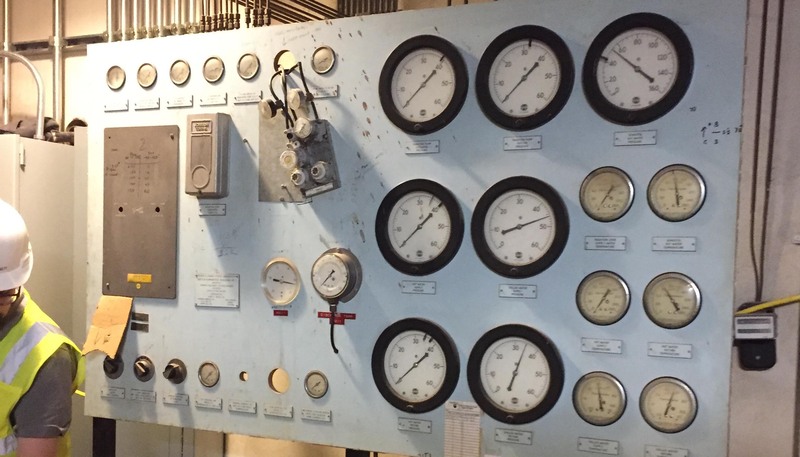 The new power switches were installed over the weekend and power restored after two days without anything! 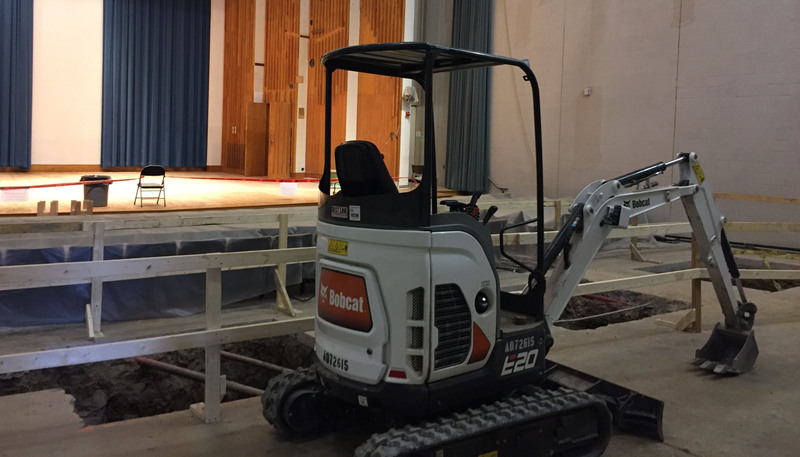 The new sprinkler system in the hallways of Music I was installed, and demolition continued on the old HVAC sysytem as the new system was inspected to begin phasing in. 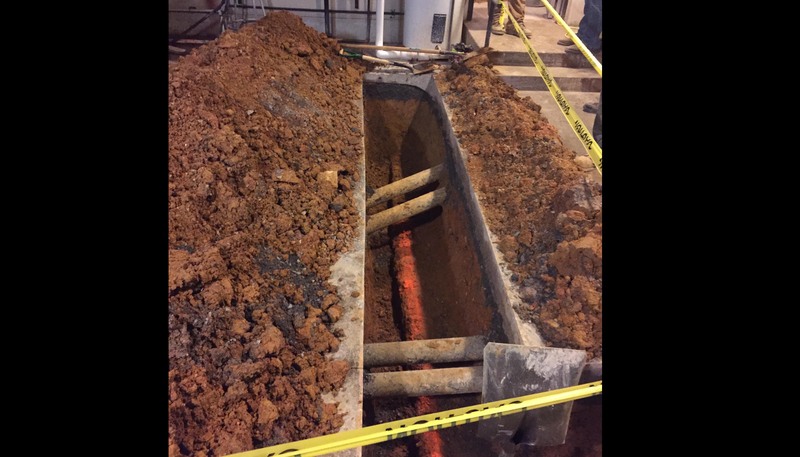 Over the next few weeks, the HVAC will be switched over to the new system. 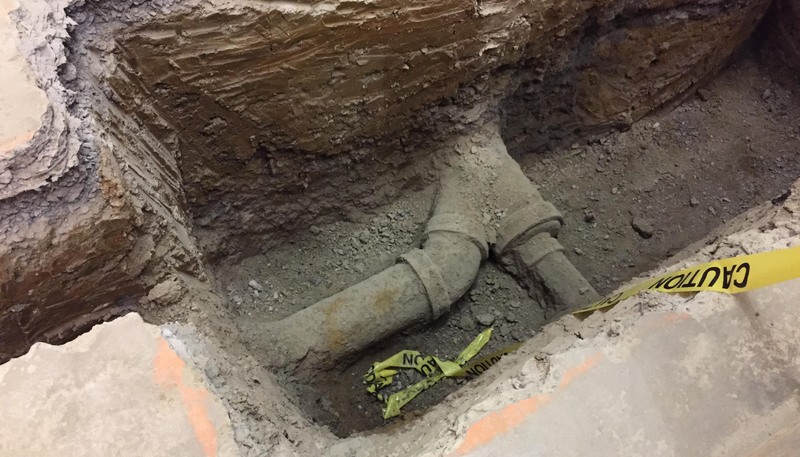 The duct work is being cleaned before they kick it in - but - until a particular zone is inspected and cleared, AND depending on the temps outside, it could be chilly in the faculty offices. 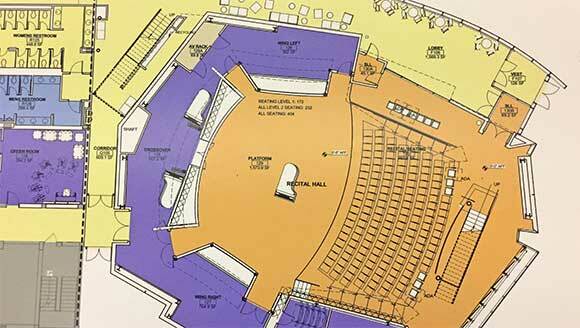 The first acoustic "tuning" of the new hall will take place July 30-August 3. 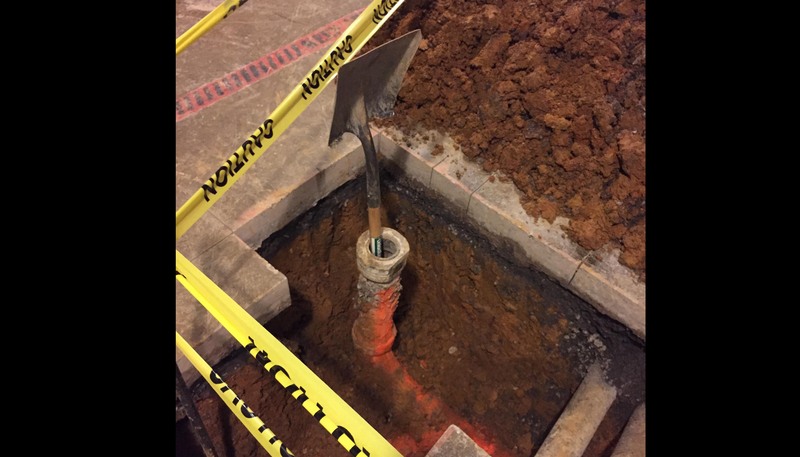 We will need live musicians to perform while measurements are taken and evaluated so that adjustments may be made or corrected during August. The acoustician also requested audience members - ideally a full house - to replicate actual performances. During the first few weeks of the fall semester, we will again replicate this with student ensembles to continue the acoustic corrections. Our great acoustician, Rick Talaske, tells us it will take up to a year or two to get things settled. Amidst all the dust, smells, and noise this week, this is a nice reminder of the prize at the end of this. 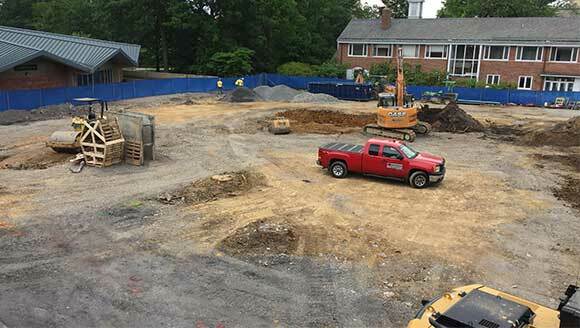 In 5 months, we’ll create the first sounds in the new hall! 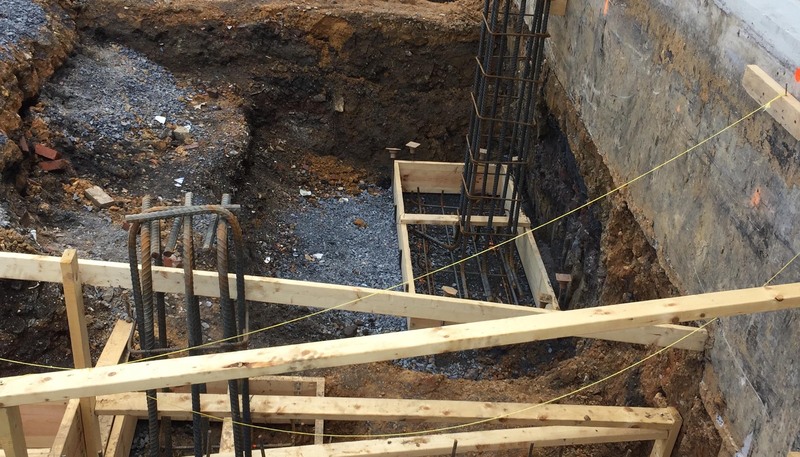 A booklet of Penn State songs has been buried in the center of the cement foundation of the new recital hall. The new hall has now been totally enclosed, and work began this week on construction of the balcony at the rear of the new stage and the balcony at the rear of the seating area. 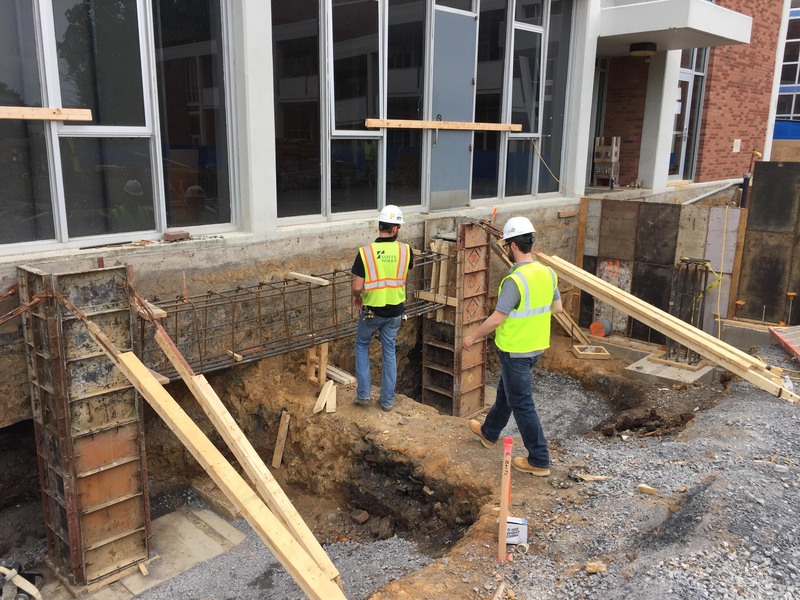 The new HVAC is being connected this month. Construction workers will be removing some of our old units located on the Music Building I roof. From day to day in Music I, we will experience some slightly warmer or cooler temperatures. 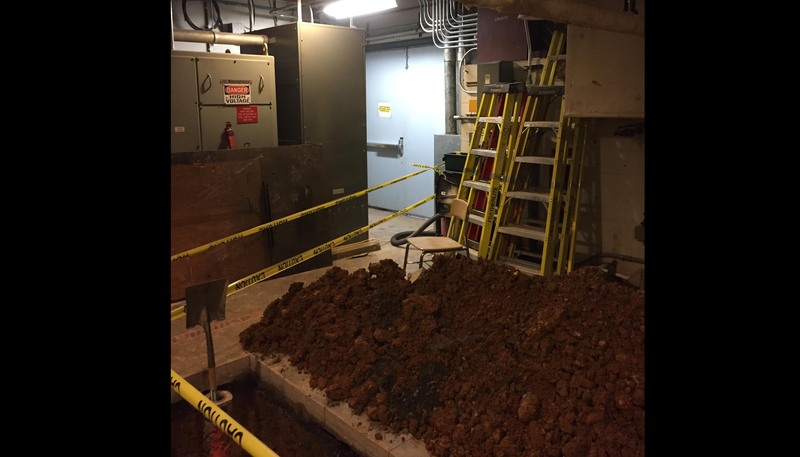 During the first weekend of Spring Break (March 3-4), electricians will be installing new electrical panels in Music Building I. 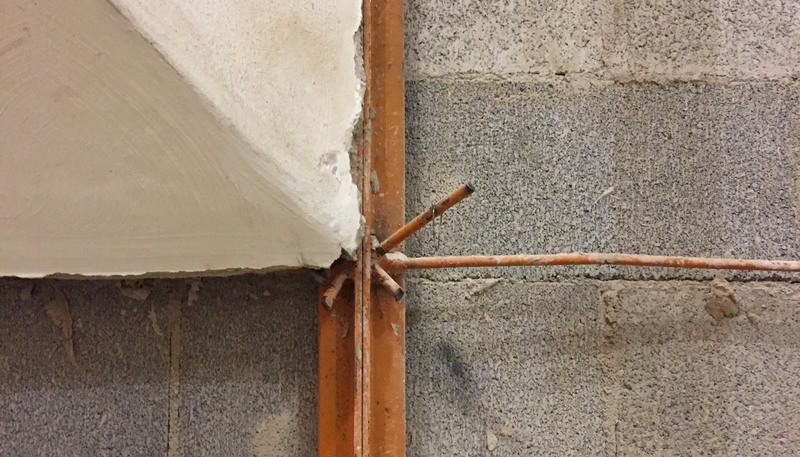 This requires an electrical shutdown to BOTH buildings while the new panels are installed. Please make arrangements not to be in the buildings for these two days. WE HAVE WALLS! 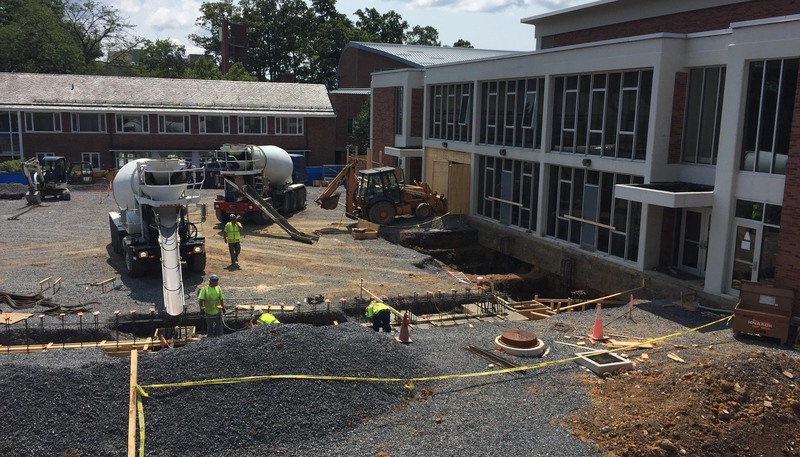 While the students were away, construction continued. Last week was a little rough with the intense cold temps. In fact, it was too cold to pour cement so that frustrated the team a little. Keep cheering for the workers and saying thanks! The men's and women's restrooms on the first floor of Music I are now gone. We have new temporary walls that tighten down the hallway width. 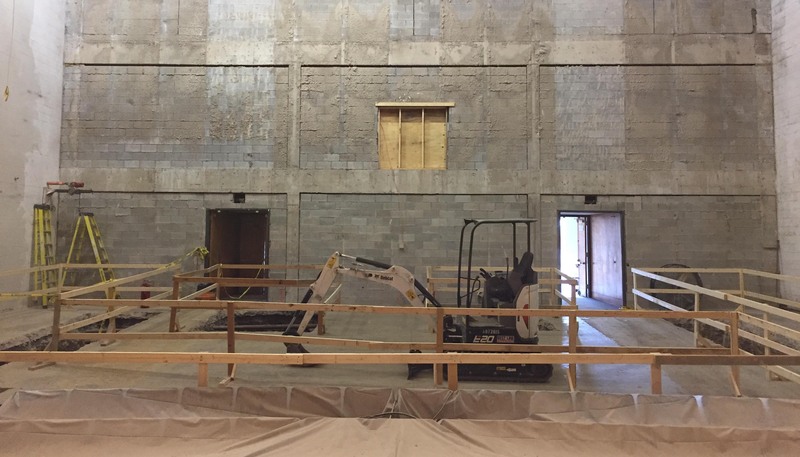 The demo crew has totally gutted Esber and are now preparing to knock out the stage walls and create new entrances into the new rehearsal hall. Also, the demo crew is preparing the old Esber lobby for construction of the new restrooms! Be prepared for the dust. 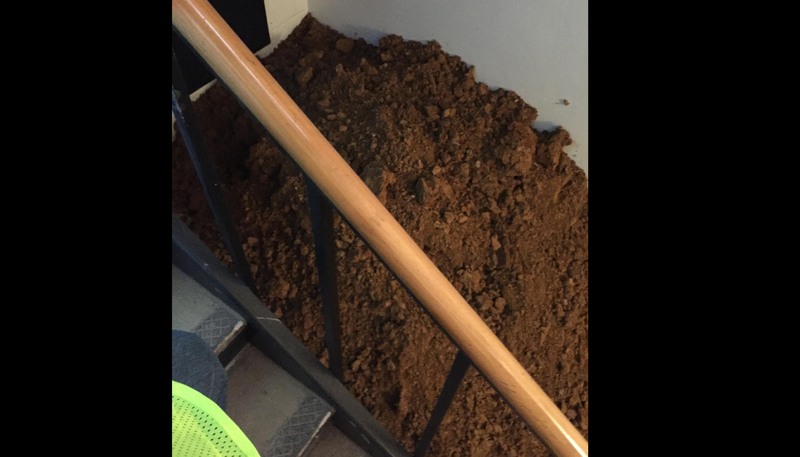 Our janitorial crew has been trying to keep up with the dust but it is a challenge - there is dust on lockers, on the furniture, and in the offices. The good news is that, once the demo is done in Esber, it should settle! 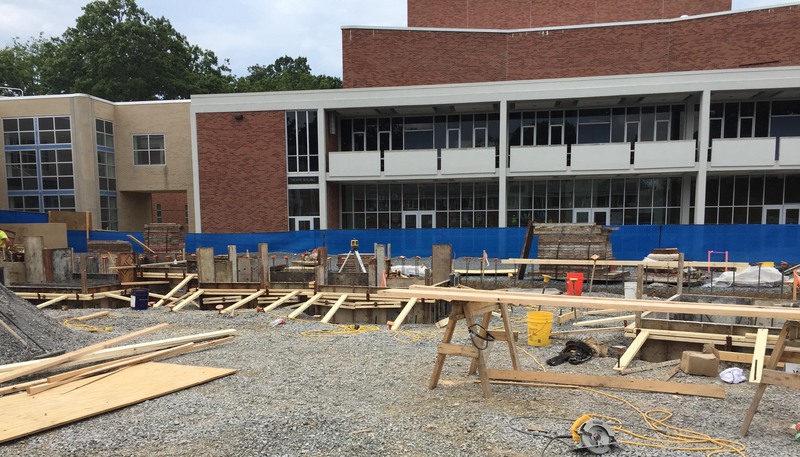 The construction crews will now be using the Music I south hallway (Rooms 112-117) as an entrance into the old Esber. Please use caution as you exit the classrooms and please do not leave cases in the hallway. The "Topping Out" ceremony for the new building was held this morning. The ceremony is a tradition in the construction industry that celebrates the highest steel beam in a building being placed into position. 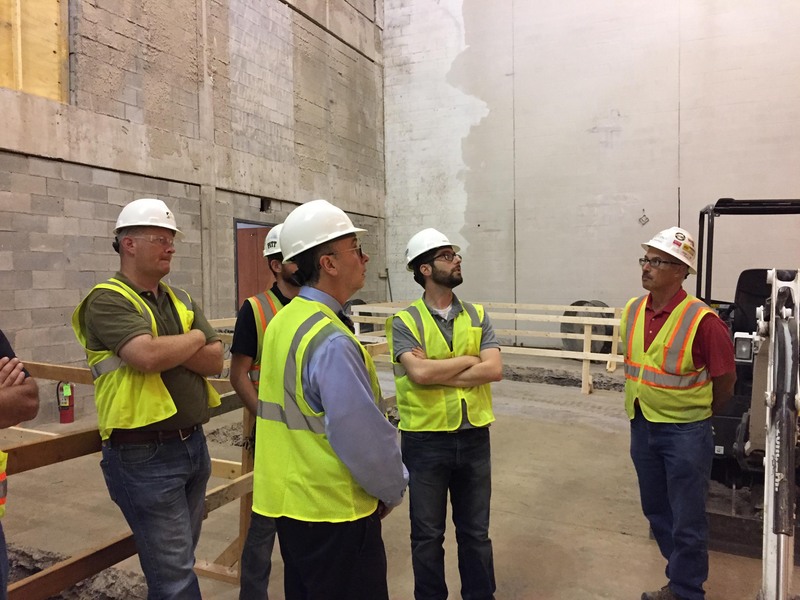 The Graduate Brass Quintet (renamed the "Hardhat Quintet" for the occasion) became the first to perform on what will become the stage of the new recital hall. Prior to being lifted into place, the beam was signed by current students, alumni, and faculty members. The event also included remarks by former director of the School of Music Sue Haug, current director David Frego, a joint singing of the Alma Mater, and Berkey Creamery ice cream. 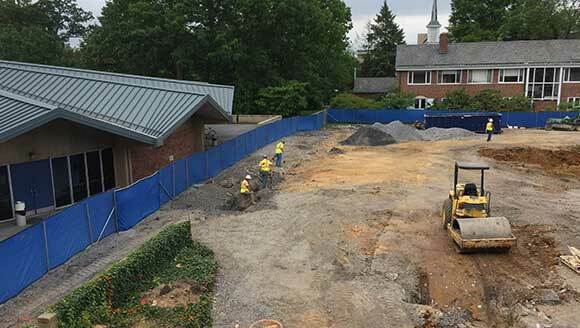 The new hall is beginning to look like more of a building and less than a gravel parking lot! Over the next 3 weeks, more and more steel will be erected. 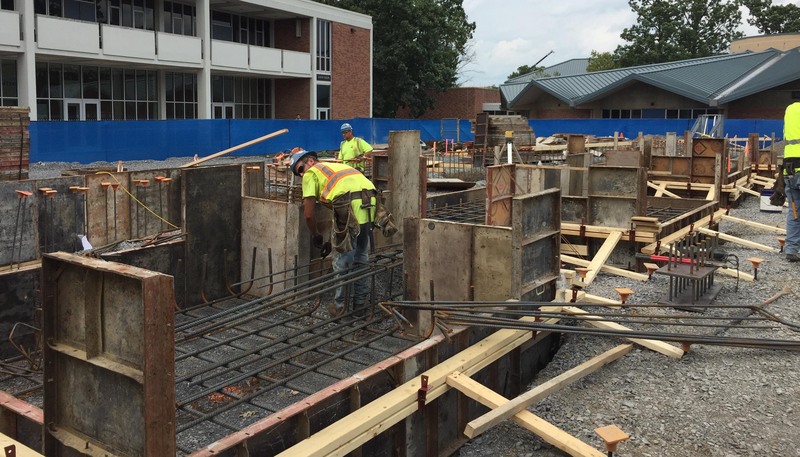 We anticipate the final steel beam to be put into place near the end of October. The final beam will include a piece of history - YOUR NAME! Yes, we will have that final beam here in time for you to sign your name on it. We will then gather as we watch the beam being placed on the building. There will be food - and music, of course! Exact date and time to be announced. 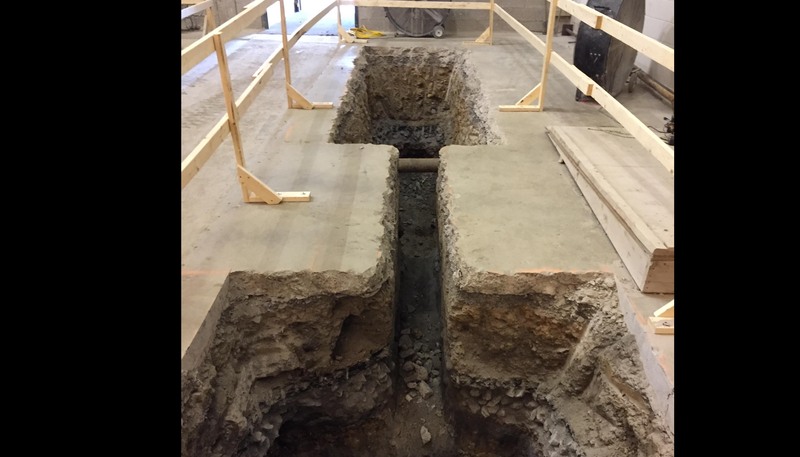 On October 5, cement trucks will begin pumping cement into the old Esber - creating a new cement floor for the mechanical room. It will be continue to be periodically noisy throughout the next weeks with parts of the interior walls being removed. Some of the work in the winter will be done from 10:00 PM TO 8:00 AM - so that our routine is not interrupted. Keep on saying thanks to the workers. 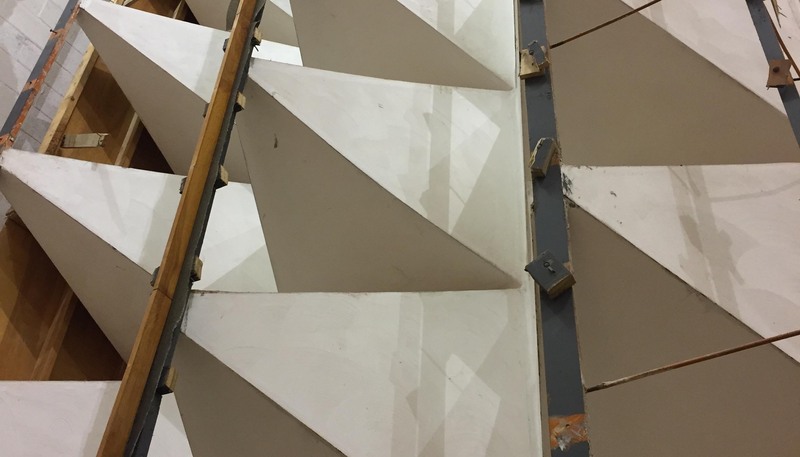 In early November, our acoustician, Rick Telaske, will be on campus to inspect everything and meet with architecture and acoustic students to talk about the project. Remember to tag your photos, #newrecitalhall and @psumusic on all of you social media accounts. 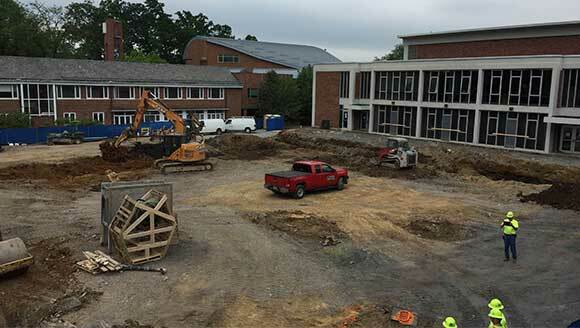 More construction pictures will be uploaded this weekend on music.psu.edu/construction. Construction workers have been scurrying about - often coming in to work at 5 AM so that our morning classes in Music I can have minimal interruptions with the noise. 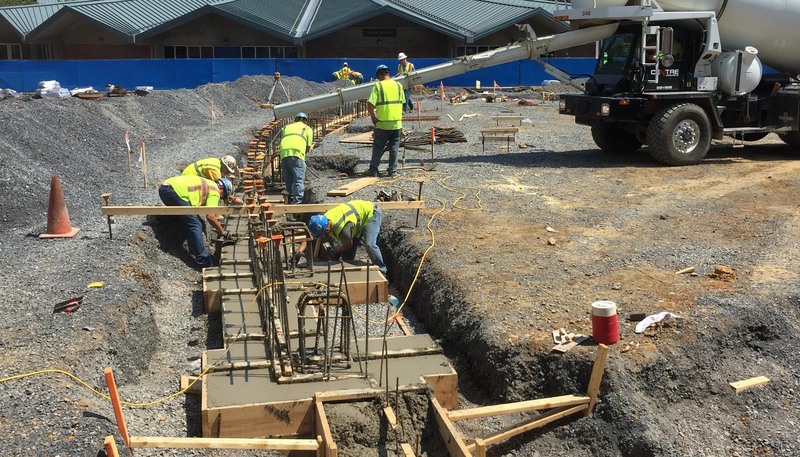 The concrete crews on the outside have been working 5 - 10 hour days and then 8 hours on Saturday to keep up with the schedule. Mark Lusk and 3 students played a 15 minute “morale boost” from the Arts Building outdoor for the construction folks working in the drizzle. The Graduate Brass Quintet has also serenaded our workers! Olivia Dowd has created a lovely Thank You sign which is posted on the doors for the workers to see. The Music I elevator is now back in operation. 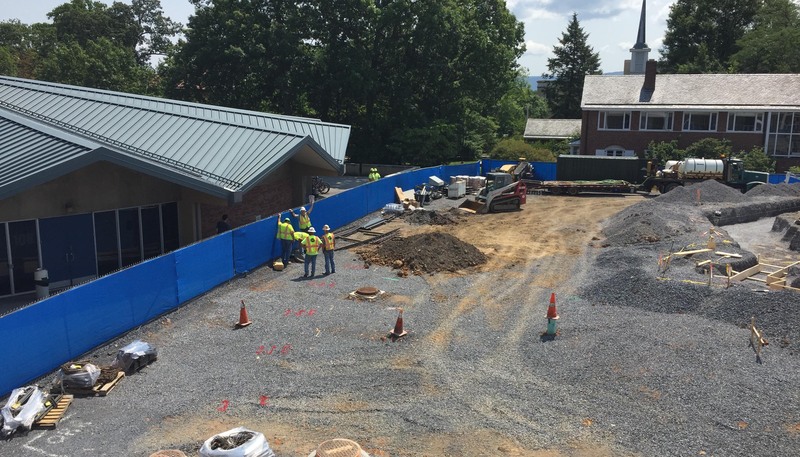 Steel is going up in Esber Hall to support the new storage room and mechanical room. Next week (Sept. 25-29), we should anticipate noise during the day when the crew begins to demolish the Esber walls. 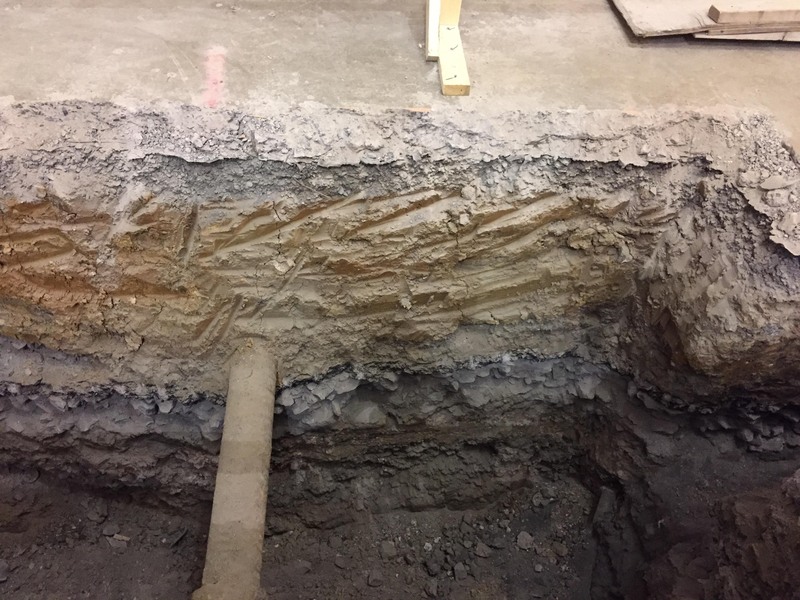 There will be temporary wooden partitions built where the workers open up the double thick cement block wall which is filled with sand for sound proofing. 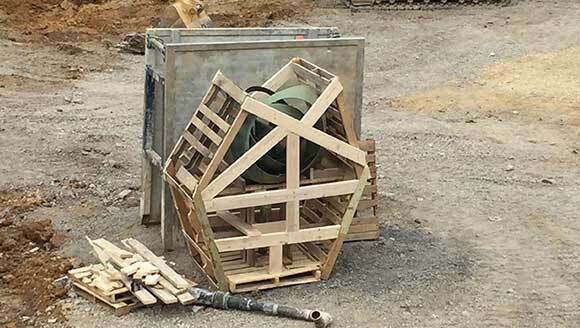 These wooden walls will provide safety and act as temporary walls for a while. They will then create the new entrance doors into old Esber for us to use during spring semester. 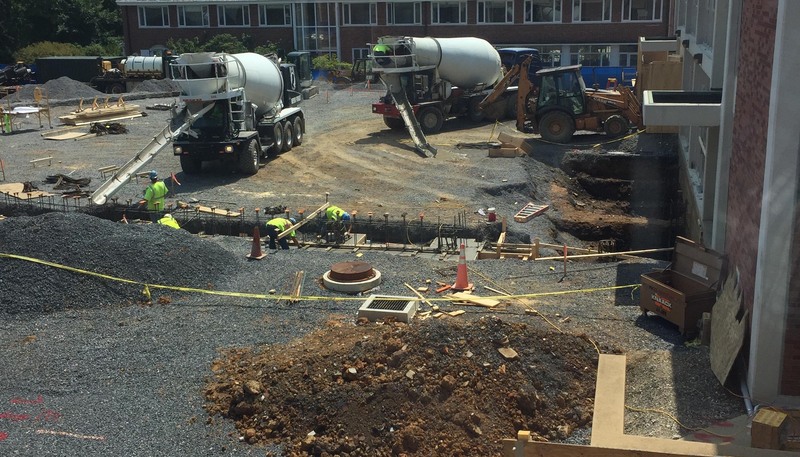 Concrete footers are being poured. 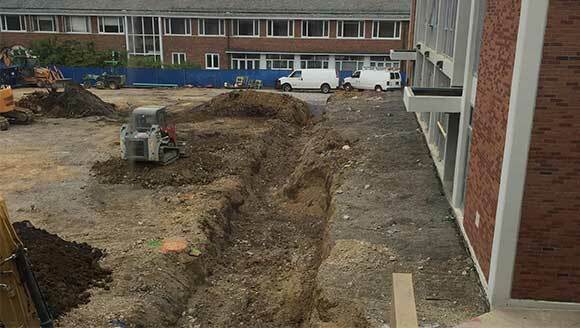 We can now see the outline of the new building. 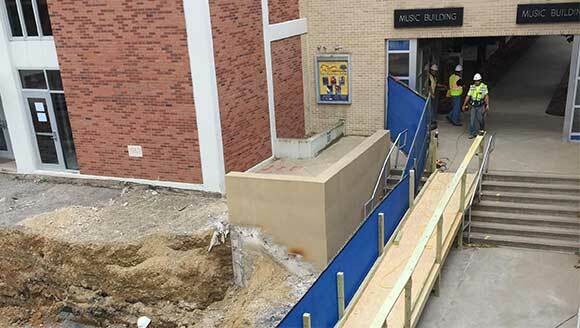 The lobby of Esber Recital Hall is, as of today, closed for the duration of the project. The lobby furniture has been relocated to Music II. Asbestos abatement in Music I is completed, power has been restored, all rooms are open to return, and blinds are being re-installed. The crosswalk work in front of Music I and II on Allen Road is now complete. 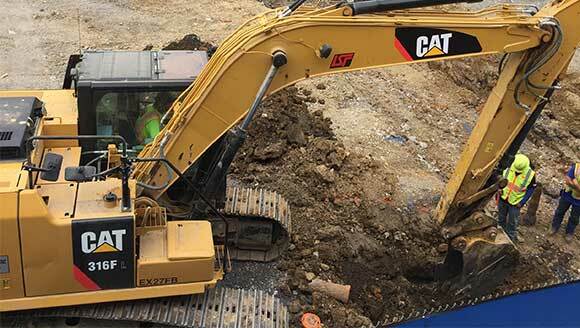 If you have concerns during business hours regarding construction, (safety, noise, smells, etc. ), please contact the main office. During the evenings, for emergency Dial 911. For non-emergencies, call campus police at 863-1111. 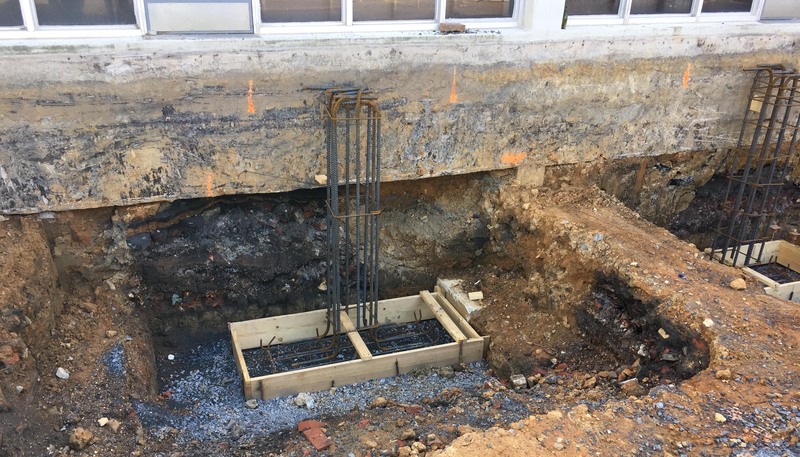 The footings are being installed for the new building. 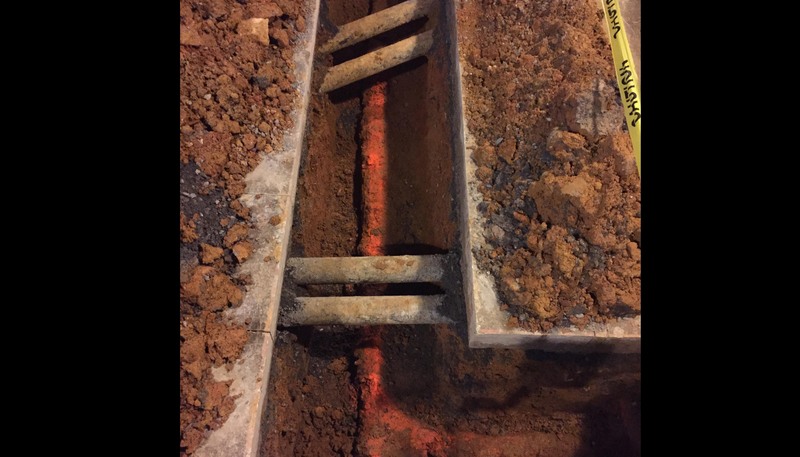 The rebar and cement work will begin next week. 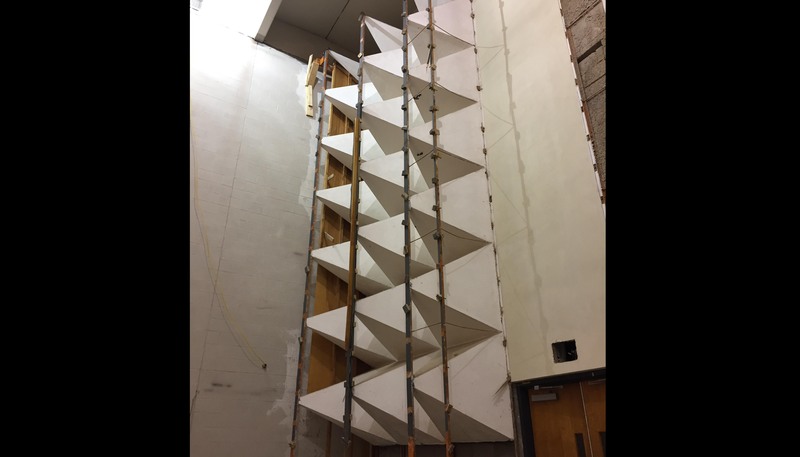 The organ has been successfully removed and is awaiting installation in Park Forest United Methodist Church – thanks to Greg Herrold for his invaluable assistance in this process! 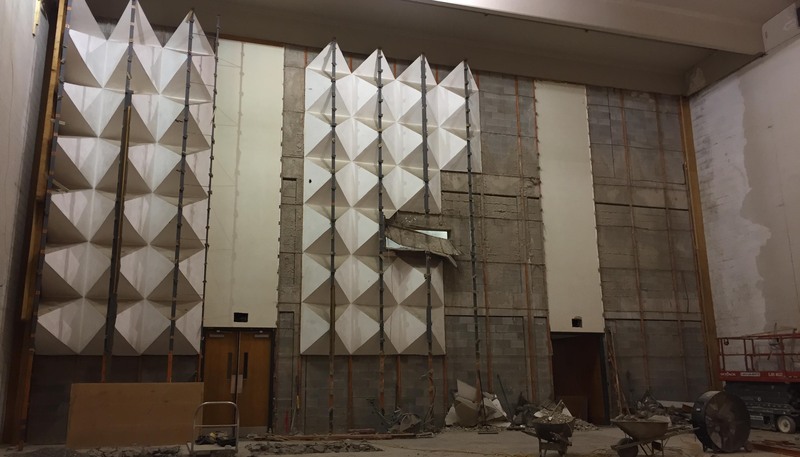 Demolition continues in Esber Recital Hall. The locks have been changed, and it is off-limits to all but construction workers. 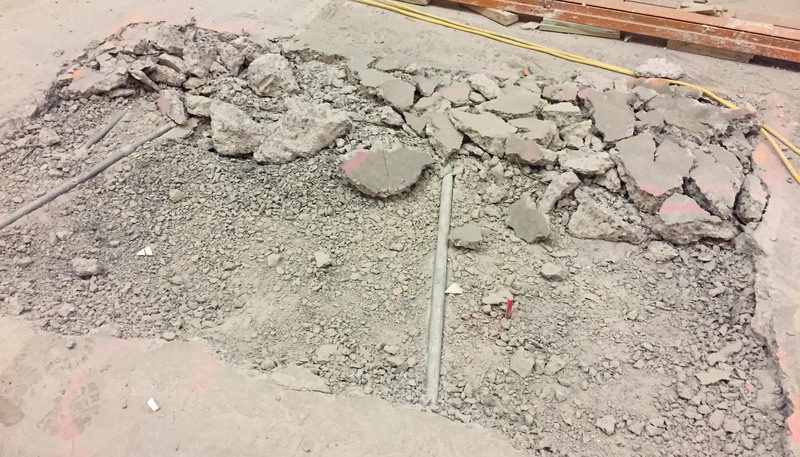 The mailroom has been demolished and is now an access point for Esber demolition material and equipment. The copy room now also serves as the mail room. 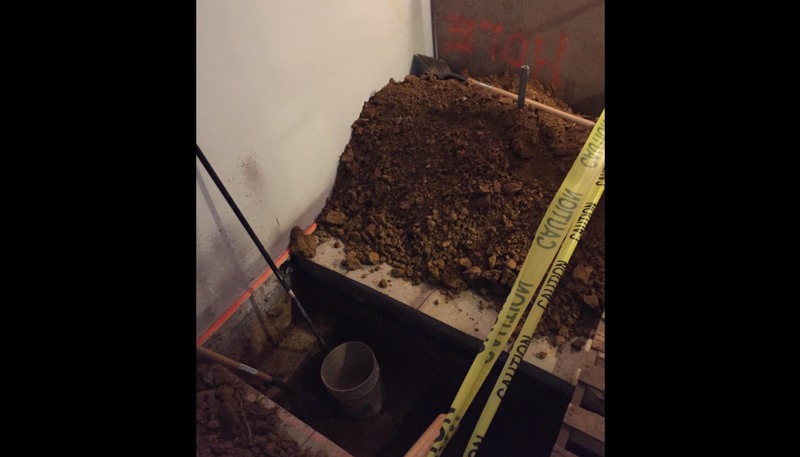 Phase V of the asbestos abatement program in Music I is occurring. The elevator in Music I is offline, and the outside doors are locked. Please enter through Music II. 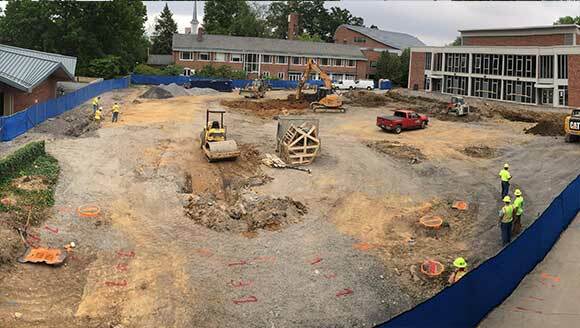 Construction crews are driving several hundred pillars of rock into the earth to create the foundation of the new hall. Music I and II shake quite a bit during this process. 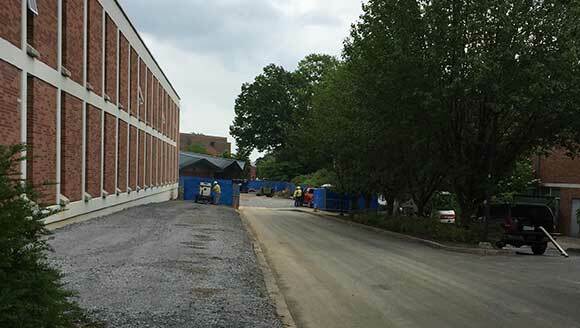 Phase III (Music I second floor) asbestos abatement is now completed, and faculty offices can again be occupied, and we will start returning lockers and re-hanging bulletin boards in the coming weeks. The hallways will retain an “industrial look” until summer 2019. Window replacement in Music I is now complete. The exit doors in the southeast corner of Music 1 (under Dr. Carr’s office) are now for emergency exit only. A revised evacuation plan will be distributed this fall. 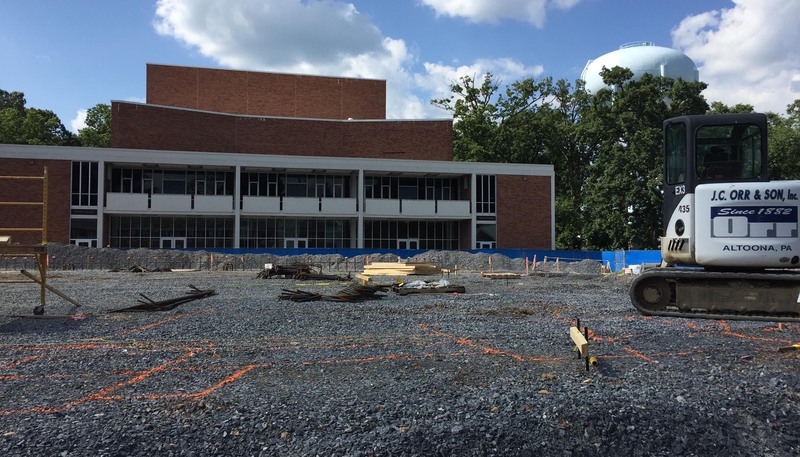 At the conclusion of the 2017 Honors Music Institute on July 22, demolition will begin in Esber Recital Hall. The back half of the seats will be removed, as well as the wood paneling. Pianos and sound equipment will be transferred to new locations, and work will begin to dismantle the organ on July 24.